‘Police arrested Jones’ – that is a sentence in the active voice. The subject (police) is the actor: the receiver of the action (Jones) is the object. We say the verb (arrested) is being used transitively because it requires an object; the verb is said to be used intransitively when it does not need an object. Look what happens to that perfectly good sentence in the active voice with a transitive verb when we write the sentence in the passive voice – when the receiver of the action becomes the subject rather than the object: ‘Jones was arrested by police’. We now have five words where three told the story before. Well then, how about Jones was arrested? That’s three words, it keeps the main subject to the fore, and it reduces redundancy: Who else but the police would have arrested him? Whether Police arrested Jones or Jones was arrested is better depends on the surrounding text. There are arguments against the passive voice, in certain contexts, but those presented here are invalidated by a bad example. Not an auspicious start. The next chapter looks at sources of wordiness. It compares ‘shorter and more direct’ phrasing (Sandy Smith hurt his leg; Lawrence Jones was killed) with what it calls ‘passive reporting’ (Sandy Smith suffered a leg injury; Lawrence Jones was fatally injured). Whatever about the styles’ respective merits, they can’t be distinguished by grammatical voice: Both Smith clauses are active; both Jones clauses are passive. Talk of ‘passive reporting’ is confused and misleading. This morning, the hoxha did the ritual cleaning of the bodies. The girls’ bloody clothes were replaced by the white sheets. In a sidebar opposite these lines, we are advised: ‘Note the quality of observation. Concrete nouns, active voice verbs.’ But of the two verb constructions quoted, did and were replaced, one is active and one is passive. One out of two ain’t good. The next few verbs in the report are active, but the damage is done – the impression is of authors and editors, writing about writing, unable to identify the passive voice at the same time that they complain about it. Fall into well injures boy (Arizona Republic, 10 December 1957, p. 1) may well be back to front, story-wise, but it’s not passive – it’s active. Fall into well is the subject, and injures is the verb. There’s nothing passive about it. You can’t demonise the passive voice with an example in the active voice. It just makes nonsense of an already simplistic argument. The headline in the passive voice could be: Boy injured by fall into well. This may not be elegant, but it retains Evans’s preferred front-to-back order, and it includes an important detail (the injury) which is missing from Boy falls into well. And I don’t know about you, but I would never say ‘Boy falls into well’ in ordinary discourse. It’s not ‘what people say’. The second headline is indeed passive – at last! – but it seems to be a contrived case. US demands release of seized ship is a real, historical headline, but I found no evidence of the passive formulation, so I’m guessing Evans converted it to make his point. This is unsatisfactory and unconvincing, since I can’t imagine many sub-editors approving it. Given the book’s theme and the experience of those involved in its publication, you’d think someone would have noticed the problem it has in identifying the passive voice – whatever about the bias in how it’s characterised. You would hope the author, editor, proofreader or fact-checker would have addressed it. For a book offering expert guidance on English prose, it’s utterly inept on this point. These are just a few examples I came across fortuitously. If I went looking, I’d find a lot more. Language Log has catalogued many other cases over the years. Essential English has a stellar reputation, as shown by its back-cover blurbs. Across the political spectrum, it’s lauded by editing luminaries as a ‘bible’, ‘the standard and brilliant text on written English for journalism’, and so on. In many ways it is a helpful manual. But I wonder how influential its grammatical ignorance has been. If this is a bible for journos, it’s no wonder they’re confused about passives. This entry was posted on Friday, May 13th, 2016 at 12:26 pm and is filed under editing, grammar, journalism, language, syntax, usage, writing. You can follow any responses to this entry through the RSS 2.0 feed. You can leave a response, or trackback from your own site. I have heard it, in slightly different forms, but I’d forgotten it! Excellent post. It’s embarrassing how many supposedly reputable writing advisers confuse active voice with vivid style. Thanks, Tom. It is embarrassing, one of several bad rules of writing that people use as a substitute for thinking. And Muphry’s Law: yes! I meant to mention that but forgot. Mind you, even if it was pointed out to him, he might deny that ‘is said to be’ is passive, given his track record with identifying it. “The girls’ bloody clothes were replaced by the white sheets”. A terrible sentence regardless of voice. Even within context. I don’t know about that, but it could be profitably reworked. What is rarely mentioned in these contexts is the role of subeditors (a dying breed as media organisations slash jobs) and copytakers (a breed, I suspect, almost extinct, except perhaps for a few news agencies). Having read copy to the latter, and having them correct and improve my work (e.g., “you used that verb three pars ago, what about ….?”). The copy takers were invariably women, and invariably had a better news sense and style than I ever bloody did! Passive/active? I would take their advice; and then the subs would give it a work over. Apart from a few blues over the years, I always found copy takers and subs usually improved my work … but I was still inspired by Harold Evans. Good subediting is invaluable, I think, and brings noticeable quality and polish to a publisher’s texts, just as its absence makes prose stand out for the wrong reasons. It’s understandable for financial reasons that some outlets would skip the step, have writers do it, or just do it after publication as necessary, but it’s an unfortunate state of affairs. Truly, posts like this can’t be written enough. You are thanked for reading it. I have noticed that, in general, discussions by the anti-passive people rarely give any context for their example sentences. But one of the major uses of passive voice is to link the subject of the sentence to what has gone before. Passive voice is a part of Latin (‘Passus et sepultus est’, for example, keeps Jesus as the (omitted) subject) and many related languages. My ESL teacher’s experience of passive voice is how difficult it is for many second language learners: it combines verb [be] (which has more forms than any other – three in present simple and two in past simple) with the ‘past participle’ form* of the main verb, some of which (particularly the ABC set of irregular verbs) are very difficult for students to remember and produce, and also represents a cognitive leap for speakers of languages which don’t have a similar voice system. Hardline prescriptivists routinely ignore context in presenting their argument for or against a certain structure. They have to, because context – drawing on people’s intelligence, flexibility, and common sense – tends to undermine their less-sensible positions. Much easier to just outlaw a piece of grammar or vocabulary and default to ipse dixit. You make a good point about teaching the passive to English-language learners who may not have its equivalent in their native tongue: I hadn’t considered that, and the ‘cognitive leap’ it requires. Oh my goodness, I am truly shocked by these examples. Just when I thought I was able to inure myself to the stupidity and/or ignorance of the world, I am plunged into despair yet again. I will just have to cheer myself up by looking for an opportunity to say ‘eleventy megazillion.’ I grew up in a family in which creative naming of enormous numbers was highly valued and enjoyed, but I’d never heard eleventy megazillion before. I love it! Bad enough that an experienced editor would be so clueless about the passive voice, but to find such cluelessness showcased multiple times in an acclaimed manual of writing is almost beyond belief. Yet there it is. I’m glad eleventy megazillion brought some relief! :-) I must have heard that not-a-word protest umptysquillion times. Now you’re doing it on purposely, aren’t you? When I taught English at University, my students had, by and large, been so terrorized into “never” using the “passive voice” that they didn’t believe me when I insisted there were legitimate reasons for using the DirectObject-Verb-Subject sentence structure. 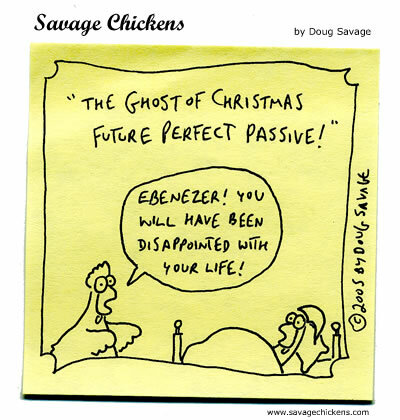 Students had been told so many bizarre things about passive voice that I wasn’t surprised they didn’t understand it. Alas, that was only one of the incorrect grammar “rules” that other English teachers had taught them over the years. How sad that professional writers don’t have a clue about it. Yes, and sadder still when, from a position of authority and influence, they pass that ignorance on to others. I may have been taught a few shibboleths (splitting infinitives, particularly) by an otherwise exemplary high school English teacher, but fortunately this fear of the passive was not one of them. I’m also getting a lot of secondhand embarrassment at professionals misidentifying the passive. Yikes. I cringed like hell when I read it. It’s so sloppy, and it’s rife in groups that should be making it their business to know better. Like you I think I was spared this peeve in my education; only when I began reading manuals on writing and the like did I start to see it condemned. I need your help! 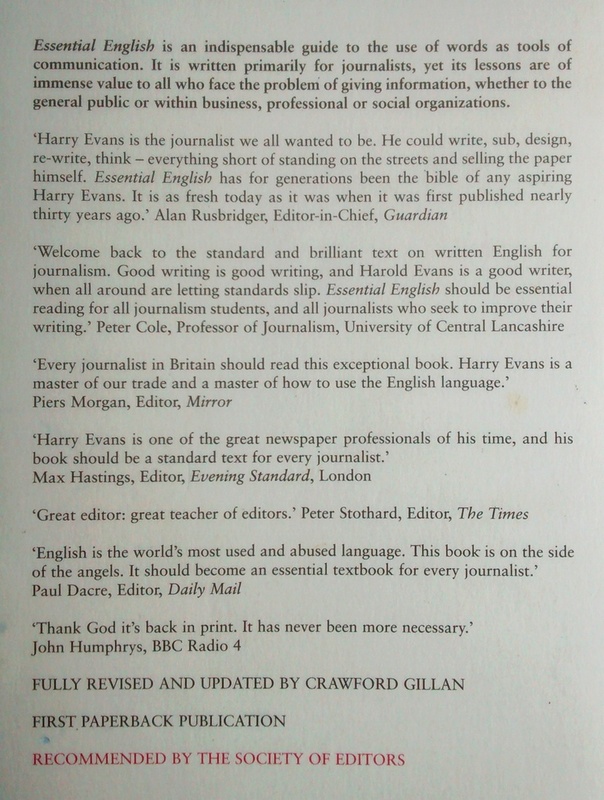 I have been reading Sir Harold Evans’ ‘Essential English for Journalists, Editors and Writers’ and a rewritten version of the below news intro is not given in the book. Would you please boil it down for my understanding? I’d appreciate it. Thank you! At the annual meeting of North Riding Dental Practitioners, the chairman, Mr. Heaton, was concerned that many local dentists did not think attending meetings was important. He said this complacency did not encourage the dentists who would soon be negotiating with the Minister of Health. Thank you! I’d be forever grateful to you. “I have time” and “time is over” are both in active voice.